Elida’s Corbin Fingerle, left, and Bath’s Noah Kindig battle for the ball during Thursday night’s match at the Elida Sports Complex. See more match photos at LimaScores.com. Elida’s Draek Littler, left, and Bath’s Robert Mooney battle for the ball during Thursday night’s match at the Elida Sports Complex. Elida’s Tyler Christoff, left, and Bath’s Keaton Liles battle for the ball during Thursday night’s match at the Elida Sports Complex. Bath’s Dylan Howell passes the ball during Thursday night’s match at the Elida Sports Complex. Elida’s Logan Johnson heads the ball against Bath during Thursday night’s match at the Elida Sports Complex. ELIDA — It took about a minute to see an old, familiar face was back in the Elida offense. 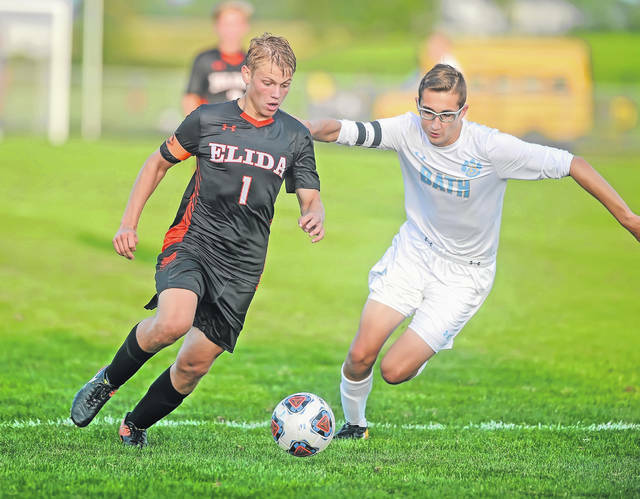 Elida sophomore Seth Mahlmeister wasted little time getting back into action. 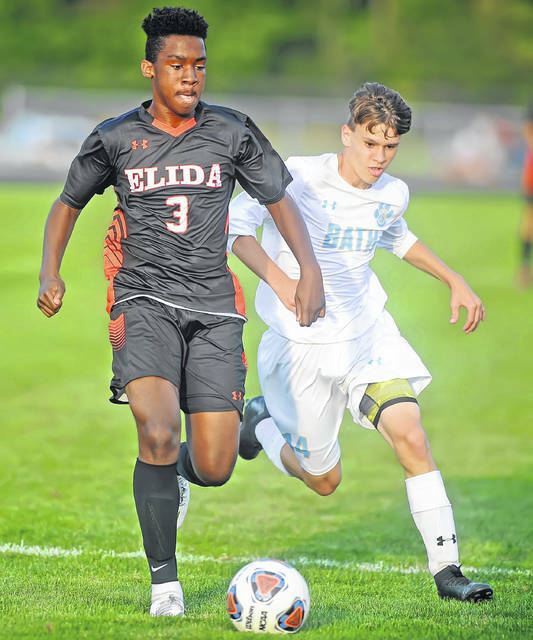 In his first game of the year, Mahlmeister scored a three-goal, hat trick to power Elida to a 6-1 boys soccer victory Thursday night over Bath at the Elida Sports Complex. 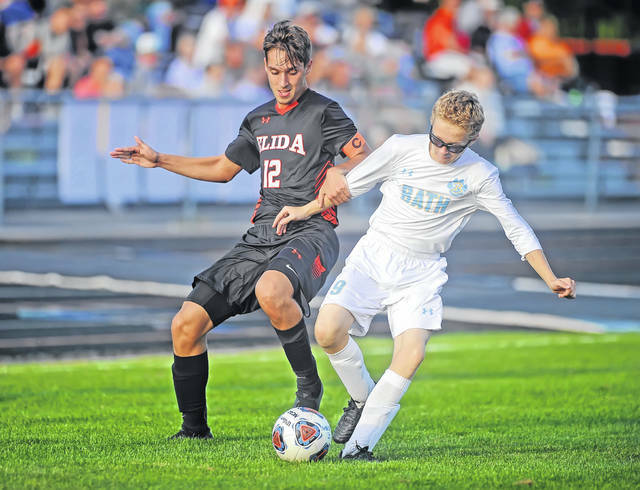 Draek Littler scored two goals for Elida and Logan Johnson had one goal also for the Bulldogs. Elida led 5-0 at the half and built its lead to 6-0 before Bath scored with 2:12 to go. Elida is 2-0-1. Bath is 3-2. It was the Western Buckeye League opener. 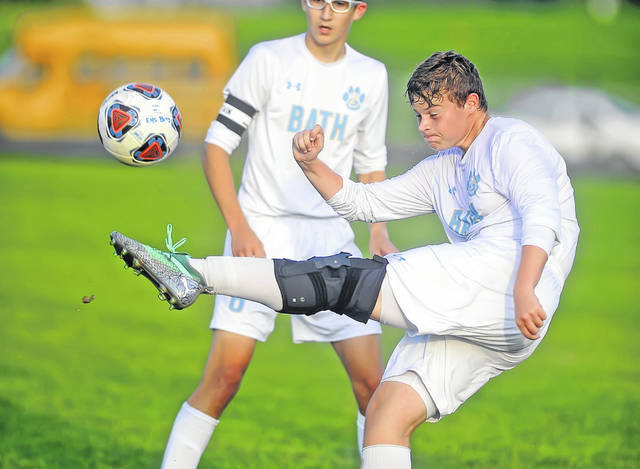 Mahlmeister, a 20-goal scorer last year as a freshman, suffered a torn ACL in his knee in February. He had been practicing, but was medically cleared to play in a game on Tuesday. “It was amazing,” Mahlmeister said. Mahlmeister missed his first rocket shot, but with 20:24 left in the first half, he drilled his first goal of the year. Sam Purtee, on the right wing, chipped Mahlmeister a ball in the box. Mahlmeister turned and fired with his left foot a low liner into the back of the net from 12-yards out. Johnson took a pass into the box by Tyler Christoff with 13:45 left in the first half. Johnson scored from 8-yards out and it was 2-0 Elida. Littler dribbled through the heart of the 18-yard box and pulled up with a shot from 12-yards out, which found the net. That gave Elida a 3-0 lead with 13:06 left in the first half. Littler then headed in a deflection from Bath from 7-yards out and it was 4-0 with 11:51 left in the first half. Mahlmeister’s second goal made it 5-0, when his shot was a one-touch shot from 10-yards out on a pass from Tyler Long. That came with 7:32 left in the first half. Elida dominated the midfield with Long, Littler, Bartels, Corbin Fingerle and Purtee off the bench. Bath wasn’t able to muster an attack in the first half. Elida outshot Bath 26-3 overall and 17-0 at the half. Elida goalkeeper Caleb Jones had two saves. Bath goalkeeper Brenton Brock made 14 saves. Mahlmeister’s hat trick came with 10:05 to go, on a pass from Aidan Bartels to make it 6-0. Jacob Garver scored for Bath. 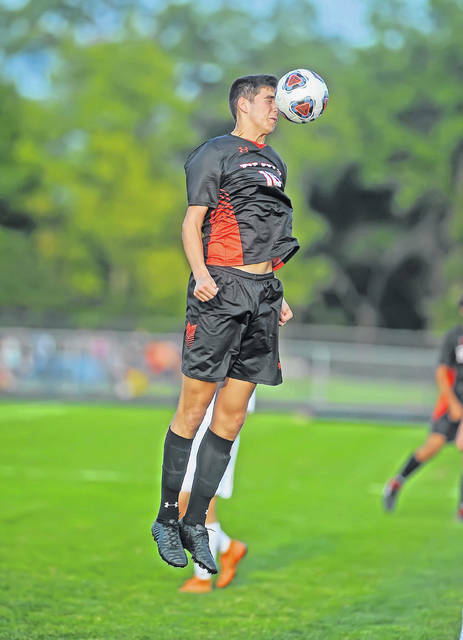 Elida had nine corner kicks, while Bath had one. Elida veteran defenders Joe Davis, Max Parker and rookies in the back Jon Stotts and sweeper Preston Layman played well, but weren’t tested until the second half. Thomas liked his team’s ability to find the open man. “We have to go as a group,” Thomas said.